Home Narmer Amenuti Are Ghana’s Leaders Witches or Are They Actual Devils? 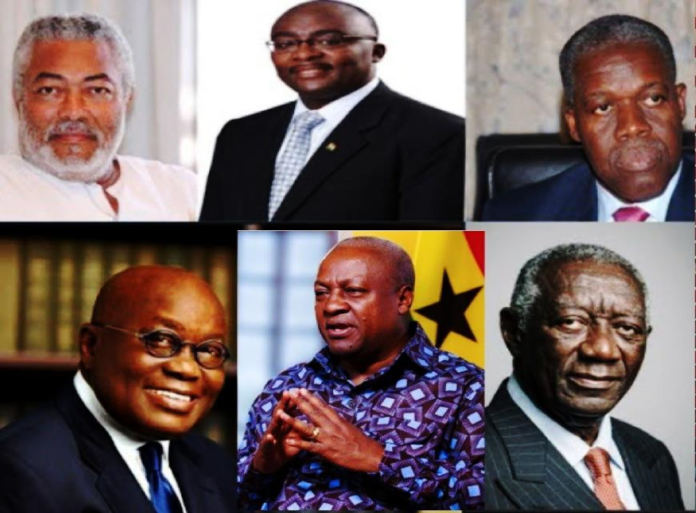 Some of Ghana's recent leaders. (Not in any order). My father made this statement when he realized that the P/NDC government of 1992 – 2000, which he loved and supported, and which, except for the leader, was made up of certain luminary lawyers—men of the book, so to speak, or bookworms, or people with long degrees—had failed to make clear why they had remained in power for so long. The P/NDC had no national objectives, and though they kept the nation under relative military discipline, and peace, they achieved absolutely nothing of economic value. Worse, the nation’s comparatively adored educational system (by the late president Kwame Nkrumah) was dismantled; the socio-cultural advancement of the nation stalled. When the NPP won elections in 2000, my father planted some hope. He believed that the many long-degree-wearing ministers and advisers to the new president would finally answer their call to duty—to out-smart the elites of other nations. However, what became of the NPP, and what was left of Ghana was difficult for the blind to visually escape. The NPP embarked on a borrowing spree (from the IMF to the World Banks) never before fathomed in Ghana’s history. The consequences of that borrowing was left to the next NDC government to inherit. What an inheritance that was! In 2008, the NDC made its second entry onto the political stage. This time, without its bombastic soldier-turned politician, a man without ideology and without much talent, except to bewitch the masses. His father was Scottish, and so he spoke English; and this captivated the colonial clerks in training, i.e. the “mission educated men and women,” who learned English as a second language in Mission School. These “educated men and women,” who I call the more educated than their ancestors (the Metha) had engaged in a feel-good myth-making, and they had come to believe the prevailing idea that the Scottish man had learned English as a second language in a colonial boarding school in Achimota, Accra. This was ignorance. The man spoke his father’s language and he struggled with his mother tongue, Ewe. (Most Ghanaians do not struggle with just two languages). How the rest of the masses were thoroughly bewitched by this man is perhaps not as irrational as the Metha’s English-love for him. After all, the man was literally “dead” at dawn, June 4, 1979. Somehow he was resurrected, like the Christ in Christian mythology, and he wreaked utter vengeance on his enemies, in the same way that Christians in Ghana believe that Jesus will finally in his second coming dish out utter violence to Satan and his bad angels. The whole myth-making about the soldier-turned politician was bizarre. I say he was a witch, others say he was like Jesus. And so suffice it to say that it was good riddance that the NDC’s second coming was without him. His absence saves rational beings, outside of the Metha, some headache. Ghana had endured enough under the white man—from colonial terrorism to post-independence imperialism. (About four hundred years of sheer heart-ache). This time, the NDC was led by a former professor. This time my father was sure to behold the first administration led by a man with some talent. And boy, did the professor expose how truly untalented the Mission Educated Class truly was? And then the professor died in office. There’s much to say about the professor’s lack of talents and his strange rise to professorship in an elite Ghanaian college, but in Ghana speaking about or writing about the dead can be deemed a disrespectful act. Even the Jesus-lovers who don’t believe in their Ancestors can hate you for doing it. (Myth-making is a matter of the spirit, not the mind). But what ensued in the NDC’s second coming was the artifact of a learned behavior from the NPP government prior. If the NPP borrowed, the NDC doubled-down on the borrowing. Think about a relay race—a man hands off the same baton to another man, the race continues, with little to no interruption. The NDC borrowed over $31 Billion in a matter of eight years. For what? The man who run the last leg of that NDC administration—i.e. after the professor had passed away—finished that heat as usual. In fact, he managed to have won one mid-term elections while on his borrowing spree in the United States of America—wining and dining a Real Housewife of Atlanta. (Real Housewives of Atlanta is a reality television show based in the city of Atlanta, the state of Georgia, USA in which one white woman runs around in circles about six women, all playing dress-up, and who aspire to date men of high and monstrous purchasing power. Never mind where these men get their money, although I would be disingenuous if I didn’t state that the six women had their own profitable businesses). Apparently the president of Ghana, who had also fallen in love with motorcycles and security-glasses, was once phoned live during the television-show while he was in his presidential office in Ghana. How this man continued to represent Ghana as president; how he wasn’t impeached remains a paradox. Somehow, with his trophy mistress in Atlanta, his motorcycles and security glasses, he too had managed to bewitch a gullible masses. And because this new NPP president boasted about his family wealth, about never having to taste Yor-ke-Gari, the masses, or those who supported his narrative for good measure assumed that rich men didn’t need any more money to either maintain their riches or get richer. (Yor-ke-Gari is the fine Ghanaian meal of fried plantains splattered over soft boiled beans, and topped with flavored palm oil and gari). If you listened to the new NPP president’s description of the meal, one would imagine prison food, actually cat-and-dog-food, served within the walls of the African American Mass Incarceration centers of the United States. Yor-ke-Gari is far from the symbolism that the president conjures; it is far from the human rights abuses in America! However, it seems that again the masses were bewitched by the fear of that imagination of poverty, and they supposedly believed in the man’s prior wealth. The symbolism of a president eating Yor-ke-Gari terrified most Ghanaians. And so once a again a bewitched masses opened up their empty and deepening pockets of colonial and imperial debt to the new self-proclaimed Cambridge man who needed nobody’s money (certainly not Ghana’s money). In just over two years the Cambridge man has borrowed more than $10 Billion and has nothing to show for it, but a plot of land earmarked for building a Cathedral entirely for the Roman Catholic Church. What was more telling about the NPPs second coming was my father’s quietness about the vice president—a man with a doctorate degree in economics from another colonial college in Canada. Though in this case some evidence exist that the vice president actually graduated with the said degree from this college. I guess, what I gleaned from my father’s cold and silent reaction to the election of the NPP into power in 2016 was that of an exercise in caution. My father had become wary of bookworms, even of the self-proclaimed bookworm who needs nobody’s money. But why did my father believe in the promise of bookworms in the first place? The answer to that is partly rooted in a single event. The other part, I have carefully gleaned from what my father’s names truly mean. 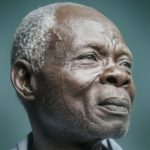 Where I come from in Ntoaboma, our ancestors believed that names have a powerful conditioning to bestow upon their receivers profound abilities for understanding the present. The name “Ta Amenuti Narmer,” which part I have inherited prescribe, and inscribe three things: (1) a historical context within which my father was born, (2) a cultural context of systematized naming and (3) the political motivations necessitating the name. And what—you might ask, by now—has all this got to do with our leaders in Ghana being witches or devils? First things first. In order for me to establish that our leaders are witches or worse, devils, I must show you why I believe in witches and devils. What is a witch or a devil? The story of my father, and particularly why he came to believe in bookworms for leaders establishes my firm belief in the idea that leaders who portray themselves as decent human beings, especially before their blinded voters—who expect nothing but warmth in return for their support—yet stab these voters in the back, can only be witches. Worse, leaders who buy their way into public position, or force their way in, without a free and fair collective process, and feign decency while they loot the national coffers are nothing but devils. When I say a witch, I picture the two-faced owl. In one sense it is a beautiful bird when it peeks at you forwards (in the direction of its toes), but it is terrifying when it stares backwards (like a dwarf, with the torso, knees, ankles and toes all pointed in the “wrong” direction.) It turns out that the owl is actually not a “wrong” bird when it stares backwards. One might say that my own inability to turn my head completely around makes me a biased animal in search of a reason to dislike another animal. I would disagree. And so the owl’s feature of petrifying people backwards, at night, is my pet-peeve, and it is what the bird truly is—it is one decent bird peeking forwards, and an entirely different creature peeking backwards. When I call our leaders witches, I picture them at night, like owls, perching on broomsticks defying God’s law (gravity) in monstrous proportions, flying away to meet the grand-witch Queen Elizabeth of England, and then I see them (and this part is clearer than the former) returning to Ghana early morning, prepared to loot the nation and its resources with a smile on their faces. That I describe the hideous behaviors of human beings, like Ghana’s leaders, in the morphological character of an innocent bird is not fair. But then again, how else can one truly capture the image of the two-faced character of our leaders—who appear at noonday as angels, yet behave in devilish ways under cover? The idea of witches, and devils, and why my father once believed in bookworms go hand in hand. Spare me a moment of expatiation. My father had come to believe that special events, which had the ability to shape the minds of readers, could only be stored in books. Oral narratives couldn’t do it. He apparently came to this conclusion after a long visit to Mali, while tracing the historicity of one-sixteenth of his family tree. What my father uncovered is that his great grandmother was a priest from Timbuktu, proper, and a woman of the letters. She had been trained as a bookkeeper (or in today’s terms, a historian of sorts). She kept the books for many kings and traveled around the sub-region doing it. She got rich as a result, and became a powerful queen of sorts (more precisely, a powerful bookkeeper), almost always traveling with a company of Gbeto Warriors, who had sworn to her service, after she had impressed the kings of the kingdom of Dahomey in bookkeeping at the Royal Vodun Temple in Abormey. The first time my father learned about his great grandmother, he claimed, it transformed him. Although he had heard several oral narratives of this interesting woman nothing moved him more than the books my father uncovered on his journey to one of several ancestral homes in Mali. The correct reading of these events rather shows that my father’s transformation came out of one book that the lady had kept about her own travels. Books, to my father, thence became powerful tools of transformation. My father kept, I believe in those days, what I thought was the biggest diary I had ever seen, perhaps as a result of his transformation. People who read a lot must know a lot about themselves, my father believed. Certainly—as he would often affirm—this must motivate them to become more like their ancestors; to follow in the footsteps and improve upon the torrid tracks treaded by their ancestors. More, people who read a lot, must also write a lot, and they must have found themselves within those pages in ways that speak to their souls; in ways that call them to duty in whatever capacity they find themselves. My father hopes that his humongous diary will be read by some great, great, granddaughter, who may be in the business of knowing more about herself. All this to say that the idea of being regarded as a “bookworm” carries immense favor in Ghanaian politics. There can be nothing wrong with this trend, and in fact, one can even assert that this is good until one examines the underlying witchcraft. The idea of a “bookworm” is not tied to reading and writing in any Ghanaian language, however. It is not tied to Ghana, in any form or shape. It is not tied to Ewe, Twi, Dagbani, or is it tied to Yor-ke-Gari, for instance. The idea is mysteriously tied to English, and particularly, the ability to speak English better than the next Ghanaian. Which is witchcraft. The idea is tied to upholding the tenets of the belief that there are benefits—that can accrue to Ghanaians—in English barbarism. Which is ridiculous. This is the inherent contradiction that my own father missed about the soldier-turned politician and his P/NDC government bookworms; this is what he misread about the first NPP government and its several bookworms; this is what my own father misread about the late untalented professor-turned president; and this is what many in Ghana now misread about the Cambridge man. There are no benefits in English barbarism. Quite the contrary there are many ills, the worse kind of which is the deepening crisis of our increasing indebtedness to the English and their descendants in the IMF and the World Banks. It turns out that our leaders are like owls, in one direction they look like reasonably knowledgeable people. In the other direction they are quite terrifying. Although one cannot know until the human-bird swings its head completely around to show how uniquely petrifying it really is. Our leaders in Ghana are unique in this respect. With their heads completely swung around, the masses would literally flee. This is who they really are—269 times out of 270 degrees of head rotation. Behind closed doors, and in the company of their fellow witches in the west, our leaders are devils. They eat (the future of) our children by flying away, unnoticed, the national coffers, leaving with us nothing but bottomless debt. There’s one way to get rid of the witches who daily torment our Ghanaian existence: use their methods against them. In English witchcraft, it was believed that if one walked around a tree that an owl was perched on, the owl would follow the person with its eyes, around and around, rotating its head increasingly until it wrung its own neck out of order and died. The idea is, rather than follow these witches around, and courting them for their showboat prowess in “bookwormry,” what we must rather do is test their will. When a new president is elected into office, let us ban his administration from borrowing money for three years. “Three” has spiritual significance. In this sense, I believe that making the witch rotate its head at least three times will break it. “Twice” will not work, for as I have indicated, the bird has a good range of head rotation. Let’s ban our leaders from borrowing immediately as they perch on the national coffers. Let us ban them for three years. Chances are that if they are witches, they will quench for sure. If they survive, they are human. Previous articleDiabetes & Insulin In Ghana: Capitalism Is Hurt Business. Not Healthcare. Next articleDr Dre vs. Cheats In The US College Admission Scandal. Narmer Amenuti, you have drawn our leaders in words and clothed them well enough in the picture to depict their character and it fits them.